The firm of DiSabatino, CPA uses most any accounting software that are clients use. Our staff is skilled in computer science and accounting, therefore even software that may be new to us, is easily adapted to, whether it is an ERP system or one-off accounting program, we can assist. QuickBooks is the most widely used and cost effective accounting software in the world today. It can do as little as keep your business checkbook to as much as job cost accounting and complex invoicing, and integrate with outside systems like ERPs, e-commerce software and more... We have successfully used QuickBooks in manufacturing companies with annual sales revenue towards $15 million, by simply adding a 3rd party ERP system. At Michael DiSabatino, CPA we center on making QuickBooks data accurate, reliable, and relevant, which is the heart of any accounting process. 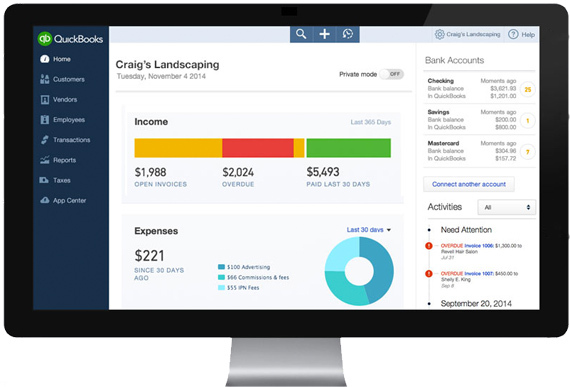 QuickBooks, like any accounting software is merely a tool. Just as the purchase of mechanical tools will not turn a novice into a professional mechanic, neither will accounting software by itself effectively manage your business? In this regard, as with most skills, there is simply no substitute for knowledge and experience. Our QuickBooks software knowledge is complimented by years of experience in accounting and financial reporting, taxation and business advisory services across a wide range of industries. This gives our firm an unparalleled advantage in helping you - the small business owner - implement a successful QuickBooks setup for your company. QuickBooks Setup - You just started your business or just started using QuickBooks and you notice that it isn't quite the "15 minutes and you're up and running" as advertised by Intuit. You're not alone. QuickBooks is easy to use once properly setup, as the software does an excellent job of recording, organizing and reporting the financial information of the business enterprise in accordance with established accounting standards and methods. We are here to listen to what you do in your business and translate it into an accounting system that works best for your business. We will provide the installation of software, setup and design of an appropriate accounting structure for your business, develop or modify an existing chart of accounts that will be suitable for your business, and determining opening balances - not always an easy process, especially if you are converting from a manual accounting system. Let us help with issues associated with installing and running QuickBooks in multi-user mode on a network, importing and exporting of the accountant’s copy, and general help for users that may have questions on tricky transactions. Transitioning from your existing software to QuickBooks can be difficult and strenuous. We can help make this transition become smoother by outlining an organized conversion strategy. QuickBooks Maintenance - Once your QuickBooks is set up and ready to use, we offer QuickBooks Checkups to help maintain your books properly. Check-ups ensure that your accounting maintains accuracy, timeliness, and relevance to your business. This service creates a priority on prevention to mitigate errors and improve the reliability of your reporting. We are also available to provide complete periodic review of your transactions and general ledger and making corrections where necessary.